Mustard is cool-season annual that can tolerate light frosts but not hard freezes. None generally needed, because mustard is customarily used as a late summer/fall cover crop to take up nitrogen left in the soil by corn or other vegetables. Grape Vine, Beans, Peas, Apple and Plum. Mustard does an excellent job of suppressing weeds when grown in a solid mass. 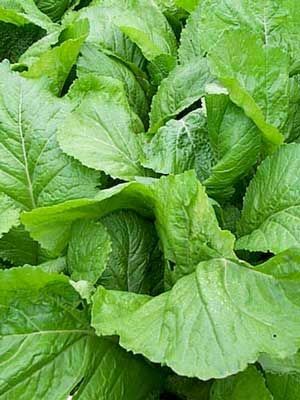 Sow in late summer to use mustard as a short-term fall cover crop. Broadcast seed into cultivated soil so that the seeds are about 2 inches (5 cm) apart and one-half inch (1 cm) deep. Thin to 6 inches (15 cm) apart in all directions. You can gather individual leaves for cooking, which taste best after the first frost has passed. Mustard residue suppresses soil-borne nematodes, so it is an excellent cover crop to grow before potatoes. Chop down the green foliage with a hoe and turn it under just before hard freezes are expected. The mustard roots and foliage will rot during the winter months. Irrigation is often needed to get a good stand in dry fall weather. Win the War on Weeds!